If you put off fixing old tired bee feeders, your not alone! I get caught out too. I have a list of beekeeping repairs to do and the list gets bigger and bigger. So the pile of feeders I was looking at repairing last spring are now needed and I am slapping myself on the wrist!- should have done this earlier James. So here’s a few tips on bringing your old feeders back to life and what to avoid when buying a new feeder. I bought many Miller feeders (a central access for the bees with 2 filling chambers) Not a great design. Some say this is better because your bees will find the syrup easier via the central entrance, as apposed to the Ashford feeder with only an access for the bees at the extreme side of the feeder. Nonsense-bees will find it no matter. Also the Ashford feeder is simply built better. The wood used to wall off the syrup is not plywood, but 8mm solid pine and lasts longer. Hence you may not need to do the repairs I am about to explain! The plywood walls of wood that separate the bees from the open filling chamber will rot and the ply will separate it time due to the on going exposure to moisture from the sugar syrup. So do not toss your feeder away, it can be fixed and serve you for many years to come. 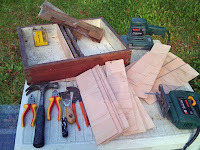 First gently remove the old plywood dividers and use one as a template to create an exact copy. I bought a 4ft x 3 ft 6mm plywood board from Wicks for £5.00 ( Homebase wanted £9.95!) I was able to get 20 dividers from that. 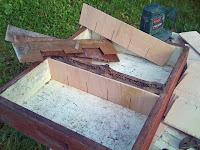 If you only need to repair one or two feeders you can use the rest of the wood to make a coverboard, roof liner etc. Have a look at my first photo, this shows the tools needed to do the job. 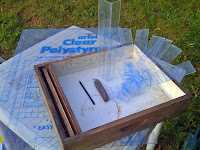 Now all the suppliers of feeders seem to supply a central GLASSpanel piece to view the bees, Miller or Ashford. This will always break in time. Dumb design fault. I break them by accident when I am cleaning them, using my hive tool, trying to remove it, set something on it, it falls out and breaks… Why do they not use perspex! So in time I am forced to replace them myself with perspex that then lasts forever. Photo 2, shows cutting new viewing windows. The trick to cutting perspex is to use a Stanley knife and score the perspex several times, cutting deeper each time. Then lay it on the very edge of a table that has a Sharp corner. Use a fully supported downward force to snap the plastic. Do not attempt to saw the sheet-it will break everywhere but where you want it to. Once you get the confidence its easy. I use a flame torch to clean and sterilise the wood before each feed. I paint the inner chambers in December. This gives me 4 months for the paint to dry and fumes to clear before I use them for a spring feed if necessary. So get to it if you haven’t already!